The Optical Imager Galileo (OIG) is a CCD camera for direct imaging at optical wavelengths (between 0.32 and 1.1 microns) for the TNG. It is mounted on the Nasmyth A. Adapter interface and is normally illuminated by light coming directly from the TNG tertiary mirror to the f/11 focus (scale: 5.36 arcsec/mm), with no other optical element in front of the CCD except those on the filter wheels and the dewar window. The OIG is designed to host a variety of CCD chips or mosaics for a field of view of up to 10 arcmin. At the moment it is equipped with a mosaic of two thinned and back-illuminated EEV 42-80 CCDs with 2048 x 4096 pixels each (pixel size of 13.5 microns). The resulting pixel scale is 0.072 arcsec/pix for a total field of view of about 4.9 x 4.9 arcmin. The separation between the two chips is 2.8 arcsec. All the numbers given below have been estimated with a 2 x 2 CCD binning. The conversion factor is ~ 1.6 e-/ADU. The readout time is about 80 s for the whole mosaic, with a readout noise ~ 4 e-. There are two filter wheels with 10 positions each, for broad and narrow band filters. You will find plots and data of the available filters in the TNG Filters page. These equations translate instrumental magnitudes (calculated using ADUs/sec), indicated by a 'i' subscript, into standard UBV(RI)c system and Gunn system. Exposure times for a given signal-to-noise in the UBVRI bands can be obtained with our Exposure Calculator. 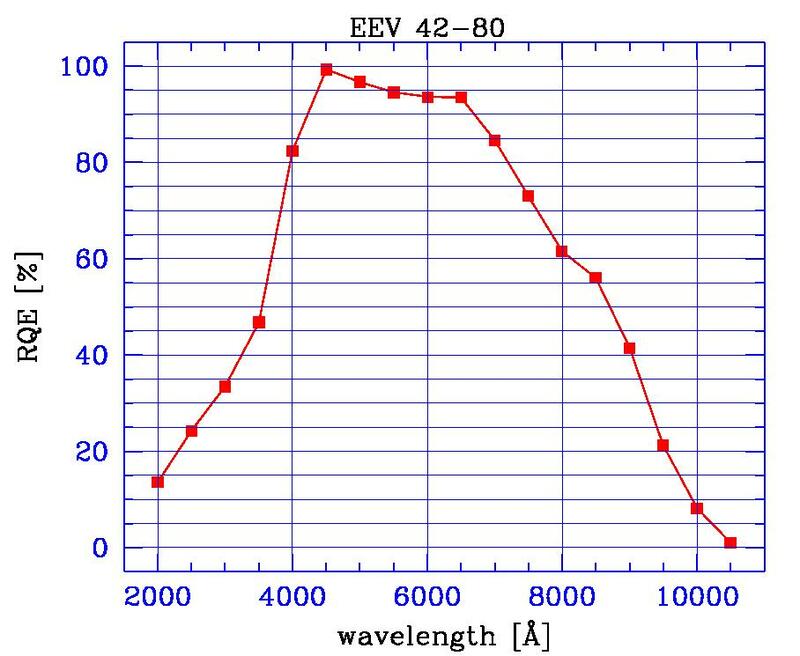 This uses zero-points from the above colour equations, and the La Palma extinctions coefficients: U=0.49; B=0.25; V=0.15; R=0.11; I=0.07 (La Palma Technical Note No. 31, see also the Mercator page). The OIG has a double curtain shutter, with very low shutter delay time, allowing a minimum exposure time of 0.1 s.
In addition to the direct illumination of the OIG by the TNG tertiary mirror, it is also possible to feed light to the OIG through the Adaptive Optics module (AdOpt) by the insertion of two folding mirrors in the Nasmyth A adapter in front of the OIG filter wheels. In this case the focal length and the pixel scale are enlarged by a factor of 3.0, while the field of view becomes correspondingly smaller, and whatever image correction is available in AdOpt is implemented on the image projected onto the OIG. In the following examples of U, B, V, R, i normalized sky flat fields are given in Figures 1 to 5. The images cut are 0.95, 1.05. The i flat field does not show any fringing because the twilight light has a continuum spectrum. An example of scientific i image with the typical fringing pattern is given in Fig 6. Click on the thumbnail to see the full graphic.